One-Point to Two-Point Conversion – The IAS main function is it’s ability to convert from a one-point to two-point sling with extreme ease and speed. 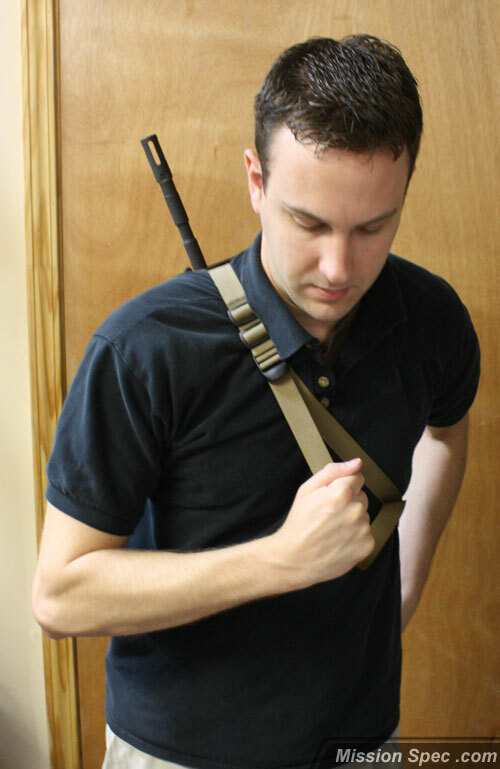 While in one-point mode the sling can be converted to two-point mode by simply attaching the front hook to the front sling point on a Weapon System. At this point the weapon system can be rotated onto the Users back. 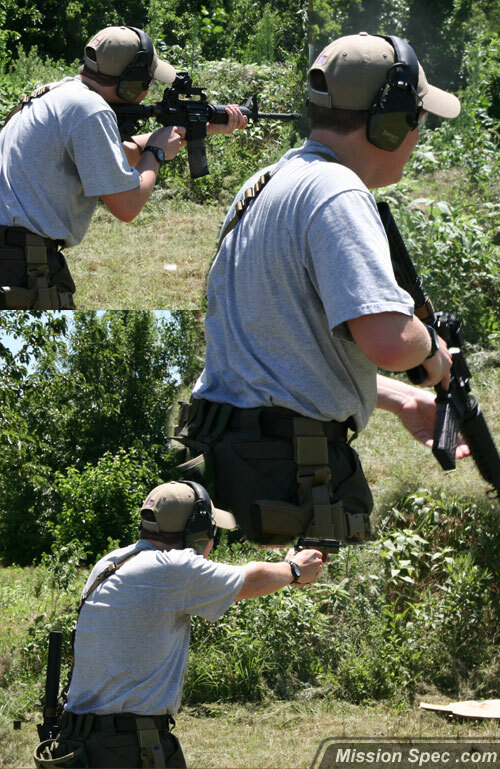 Do to the nature of a one-point sling, when in one-point mode the weapon can be fired from weapon side (strong side) or reaction side (weak side) without any problems. For added value, with the yank of one easily accessible pull strap, slack is removed from the sling cinching it closer and more secure to the User. When the Weapon System is needed, release tension on the pull strap by lifting on the Tension Lock with your weapon side hand. The sling will then return to its originally set length, no further. Rotate the weapon back to the Users front side unhook the front sling point to return to one-point mode. A Quick Detach feature of the entire sling system was a very important function of the IAS since its first days on the drawing board. 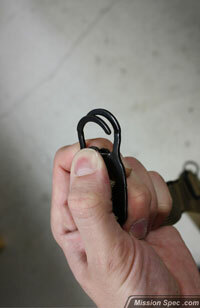 The Quick Detach buckle is always located between the two hook points. If the User, for any reason, must abandon his or her weapon they can do so with the click of a button. 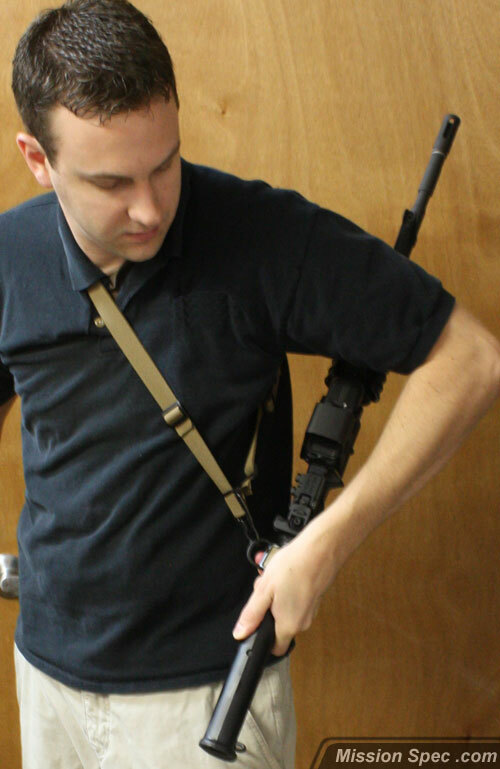 The entire sling system including the Weapon System will then break away from the User. This was incorporated for ‘Worst Case’ scenario situations such as the User being pinned by his or her weapon (squad car flips over, weapon system is hung up, etc). During the conversion process from one-point to two-point mode the weapon is secured to the User 100% of the time. If the User is surprised during the conversion process and releases control of the Weapon System it will not fall to the ground. No rifle in the dirt, no impacting optics on the concrete. Everything about the function of the IAS is easy and can be mastered with minimal training and repetition. 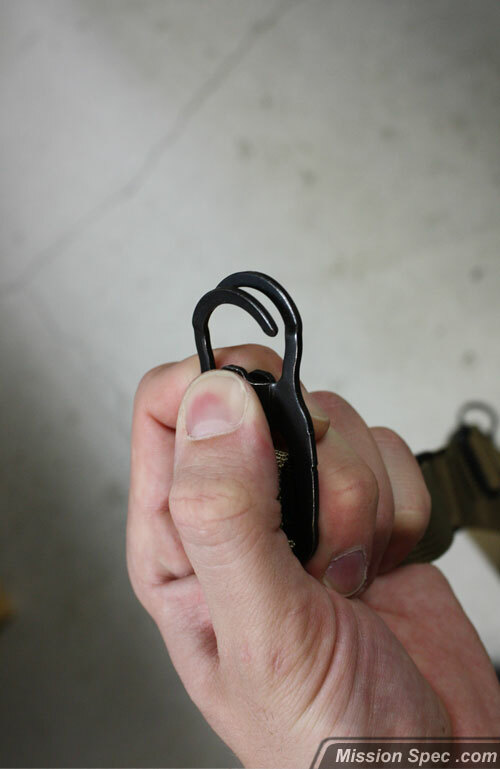 A MASH hook design was selected for the connection points. There are no springs or latches to fail or be overly complicated. When time is life, simple is best. By gripping the hook and squeezing the hooks jaws are opened and ready to be attached or unattached from a weapons sling-point. The Irene Adaptive Sling (IAS) is ready to fit any individual. The product will ship in its smallest configuration ready to fit an average person wearing no body armor. If it needs to be sized smaller, the User can remove lengths of the nylon webbing (it is recommended that you re-sear the edges with a lighter to prevent fraying). 99% of individuals will be able to size the IAS by adjusting the friction locks. Keeping larger individuals in mind (with or without body armor) we have included extra webbing material on the IAS that can be let out. The IAS ships at a length ready to accept an M4 length weapon system. This can be adjusted for longer/shorter weapon systems. Adjustment instructions are included with your IAS. 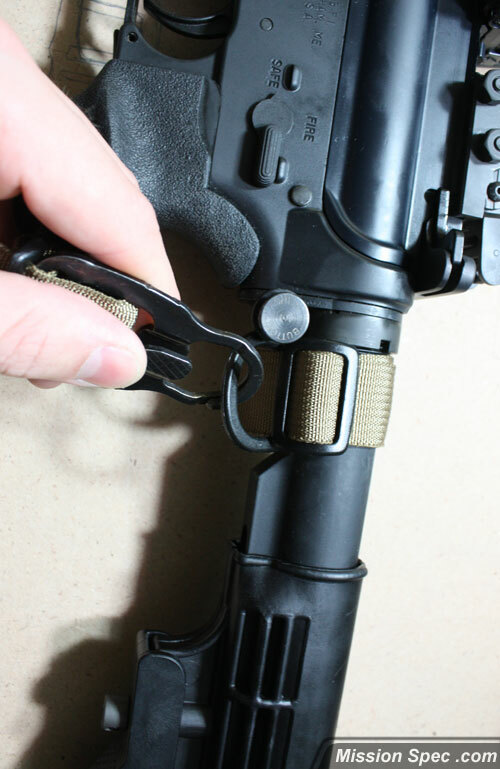 Any situation where an User may need to secure his or her carbine or long weapon while still maintaining the ability for rapid deployment of said weapon. Law Enforcement: An Officer may need to go ‘hands on’ with a Suspect. By employing the function of the IAS, the weapon system is no longer between the Officer and the Suspect. 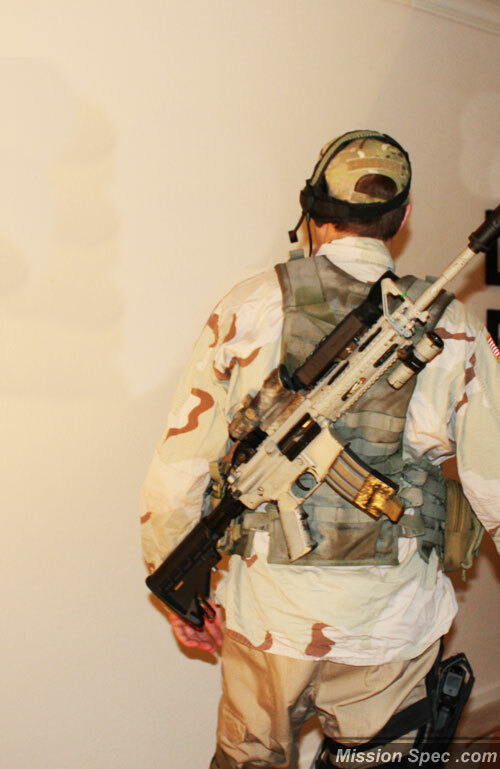 Military: During Urban Operations it may be beneficial to the User to secure their main weapon and draw a secondary when entering buildings or areas with narrow passages. Action Movie Hero: Hacking computers. Attach front sling point for two-point mode. Rotate Weapon System to Users back. 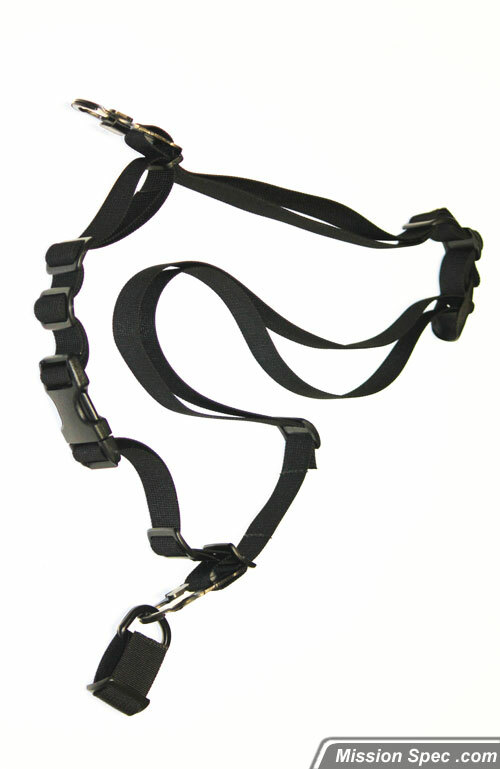 Included with the Irene Adaptive Sling is a Buffer Tube Sling Mount. The IAS works best when the Static Hook is connected to a sling point at the rear of the receiver. If you do not have a sling point at this position then use the included Buffer Tube Sling Mount. Instructions for securing the Buffer Tube Sling Mount are included with the IAS. They can also be downloaded in .pdf form here. We would like to emphasize that a rigid static point connected to the rear of the reciever is the best solution. The included fabric Buffer Tube Sling Mount will work, however a rigid point is ideal. The IAS is completely tethered to the User at all times. This includes the time during the conversion process from one-point to two-point mode. The Quick Detach system on the Irene Adaptive Sling breaks the entire sling and weapon system away from the User, not just the weapon. 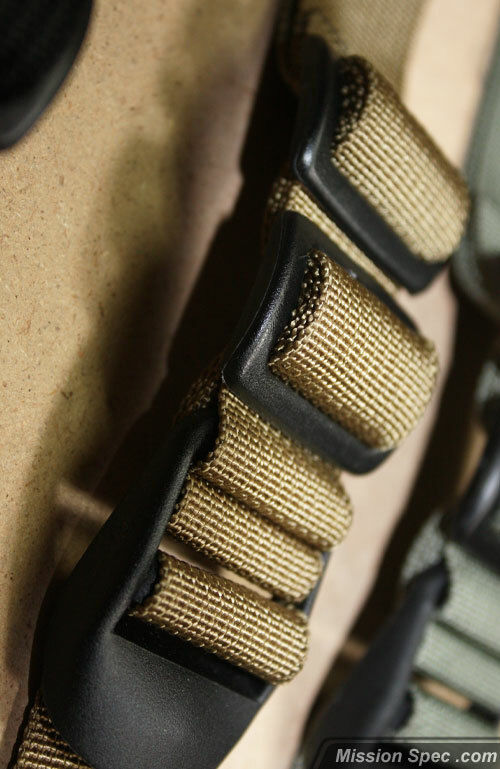 The entire sling system is created from Military grade buckles, one inch nylon webbing and steel MASH hooks. 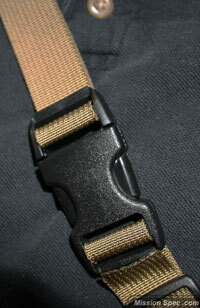 Webbing and buckles are Berry Compliant (see: Berry Amendment USC, Title 10, Section 2533a). The IAS is 100% customizable for size and has redundant friction locks at all sizing points. The Irene Adaptive Sling is available in three (3) color options. 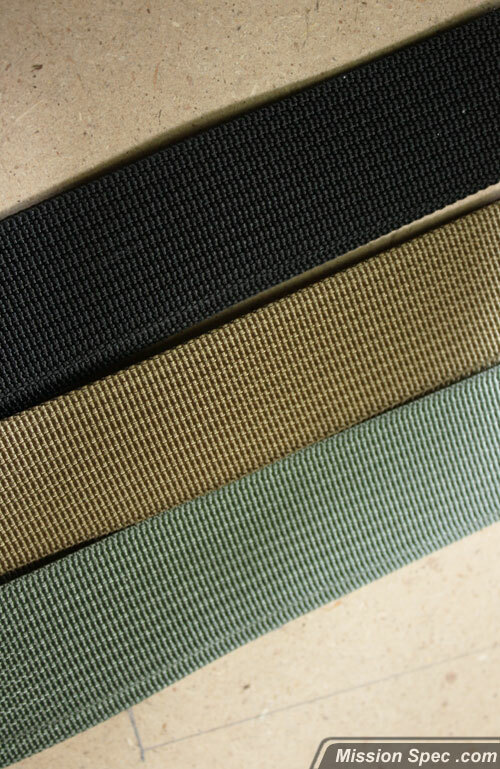 Black, Coyote, and Foliage Green. Q: Why is it named the ‘Irene Adaptive Sling’? A: The IAS (while in its prototype stage) was first field tested at the Zussman Military Operation Urban Terrain (MOUT) Facility at Ft. Knox, KY during Operation Irene. Operation Irene is a memorial event in honor of those who died in Mogadishu, Somalia, 1993. Mission Spec saw it only too appropriate to dedicate this sling to those fallen soldiers who made the ultimate sacrifice. 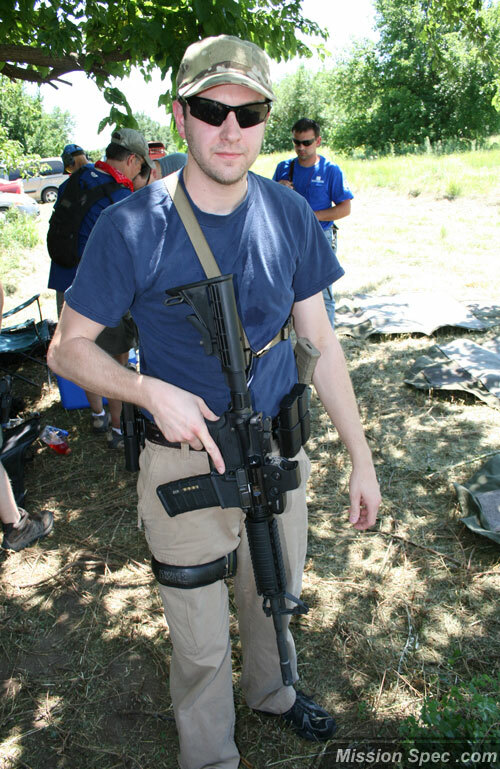 Q: Will the IAS work with my MagPul ASAP plate? A: Yes, with no complications. 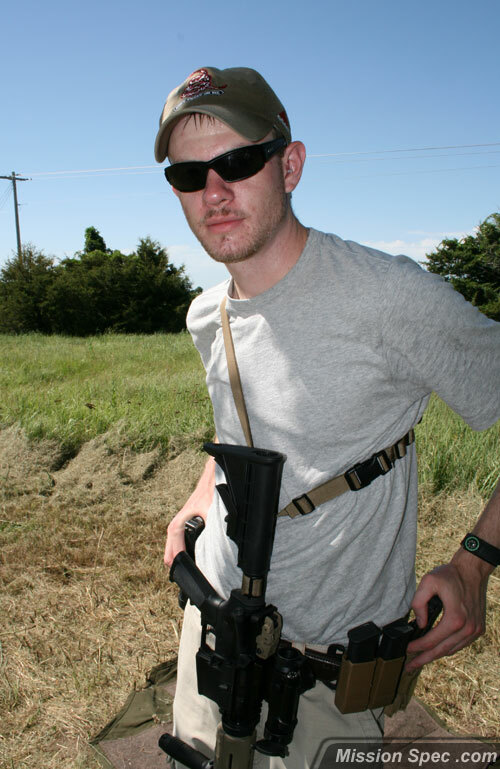 Q: Will the IAS work with my MagPul RSA Mount? Q: Can the IAS be fired from its Two-Point mode? A: Not in its shipped configuration. Lengths of webbing can be let out to extend the IAS to a larger size allowing 2-Point firing. However, this will make the one-point mode, which is the IAS main battle mode, less functional. Two-Point mode is designed to give the user the ability to use both of his/her hands when they are needed (climbing, rendering aid, going ‘hands on’). Q: Someone told me that on the range I will not be allowed to transition from one-point battle mode to two-point transport mode. Why is this? A: Most likely this is true. Changing modes does increase the likelyhood of a barrel-sweep situation. However there would be no reason to use the IAS in two-point mode on a range. If practicing transitions from primarty to secondary weapons the User should simply drop the rifle to hang and then proceed to transition. Q: How large of a weapon can the IAS support? A: The distance between the Static and Dynamic Hook an be expanded to 26 inches. If your weapons mounting points are equal or less than this distance it should be able to be used in conjunction with the IAS. Q: I am left handed. Will the IAS work for me? Is it ambidextrous? A: Yes, the IAS is completely ambidextrous. You will always place your weak/support/reaction arm through the loop that the sling creates. 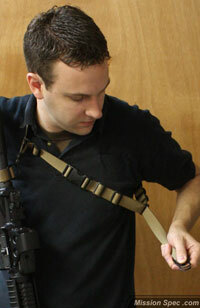 The sling will operate exactly as it is demonstrated in the instructional video on our website but as a mirror image.